OK. So, I did like the book a lot, and I really would like to read the rest of this series as well. However, I must say that the author had to earn her credibility back after naming the dimension of the guardians Pemdas. I was expecting some kind of mathematical punchline at the end of the book or something. But really, I very much looked forward to reading this book each night. It takes some science fiction, and mixes it with historical romance. If you’re a Sci-Fi genre fan, but do not care for historical romances, you’ll probably not like this book. The concept of the dimensions is a bit tough since there isn’t much of the sci-fi aspect to this novel. It’s sort of a back-burner to the plot that takes place in the castle & surrounding lands. The book starts out pretty fast with the kidnapping of Reece by the Pemdai, but then slows down when she’s in the Guardian’s dimension. It speeds back up at the end with the battle on Earth. Although I did like the story, I think it needed a bit more sci-fi in the middle. The writing is well done and the plot easy to follow. Her characters are thoroughly developed, and I can visualize them as I read. The dialogue is intriguing and interesting. At no point did I feel lost or confused. A good read, indeed. I enjoyed this book, and am interested in reading the rest of the Ancient Guardian Series. Right now you can get the book for FREE with an Amazon AudioBook trial. You can read this book for FREE if you have Amazon Unlimited. Prepare to journey into a captivating new world...that will remove you from reality as you know it! No matter where you are, facing your reality with passion and purpose will always lead down the path you were intended to go. While Reece Bryant is making her way through this world on her own, she is suddenly confronted with the truth of her existence, and the reality of her future. It is when she encounters two alluring and mysterious men, that a series of extraordinary events takes place, putting Reece’s life in grave danger. With her life in the balance, Reece must blindly trust the two mysterious strangers; and when she does, she is brought into an enchanting world that is beyond her logical comprehension. This captivating land reveals new worlds and new dimensions to which her existence is paramount. But it is once she falls in love with the stunning Levi Oxley that everything will change, and Reece’s life will be in more danger than ever before. Forced to return to Earth and face a Council of Worlds, Reece discovers there is more to this enchanting dimension than she could have ever imagined. At a moment’s notice, even thru the fog of our denial, our journey can become crystal clear. And within the revelation, once our fear subsides, we can find contentment and purpose if we focus on the things that matter most. 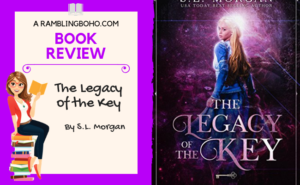 Trust—Courage—Love The Legacy of the Key is the first installment of S.L. Morgan’s new fantasy romance novel. The romance in this novel is perfectly suitable for young adults, teens ages 13 and up. Categories Science Fiction Romance Young Adult Romance Fantasy Romance Paranormal Romance From the author I have always been an individual with a very vivid imagination. I love getting lost in books that transport you into their worlds with their characters. In October of 2011, I decided to create my own fantasy world and imaginary characters that would sweep the readers into an enchanting and mystical dimension. In order to create the storyline, I asked the question, “What if?” What if there were other worlds outside of life on Earth? What would those other worlds be like? Would they have an interest in Earth, if so would they desire to harm or protect it? Once I started answering these questions, the writing process began. The idea to interweave the super-natural worlds with seventeenth century England was inspired by love for historical romances. I decided to take the passion I have for reading a good, clean classic historical romance and interweave that with my years of watching, reading and loving sci-fi and fantasy novels. The result is this book, two of my favorite types of reading material, completely opposite of each other, interwoven together bringing to the readers what I consider to be...the best of both worlds.